The best-selling, revolutionary matte, textured, sparkling Zoya PixieDustTM formula returns for Fall with six spot-on trend colors for the season. ZP698 - Tomoko: Glowing Silver. Exclusive Zoya PixieDustTM - Textured Matte Sparkle formula. ZP699 - Chita: Emerald Green. 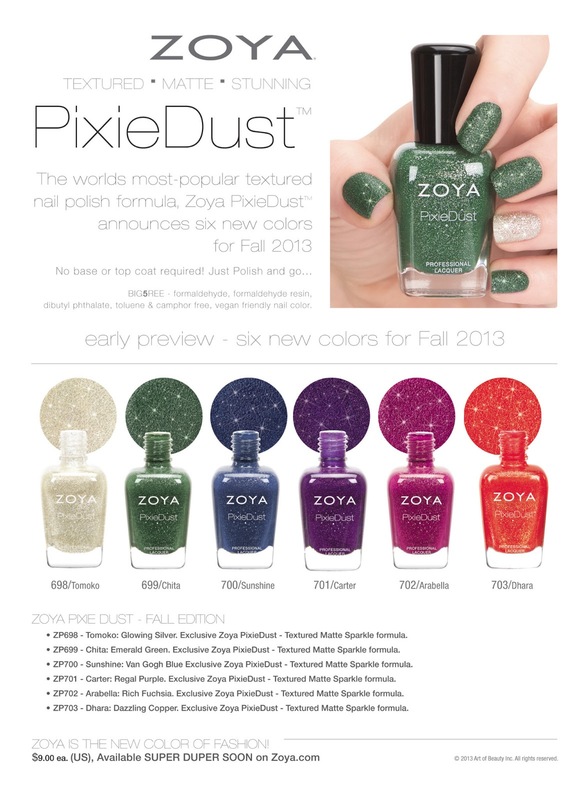 Exclusive Zoya PixieDustTM - Textured Matte Sparkle formula. ZP700 - Sunshine: Van Gogh Blue Exclusive Zoya PixieDustTM - Textured Matte Sparkle formula. ZP701 - Carter: Regal Purple. 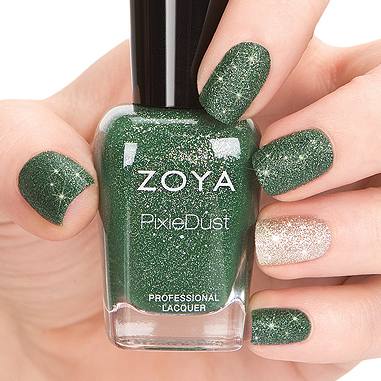 Exclusive Zoya PixieDustTM - Textured Matte Sparkle formula. ZP702 - Arabella: Rich Fuchsia. 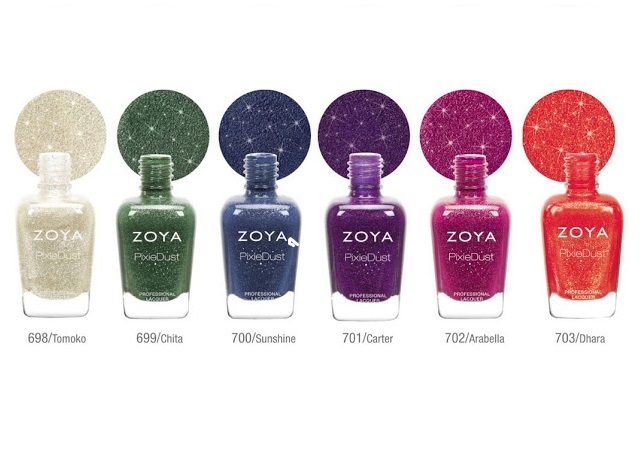 Exclusive Zoya PixieDustTM - Textured Matte Sparkle formula. ZP703 - Dhara: Dazzling Copper. Exclusive Zoya PixieDustTM - Textured Matte Sparkle formula. For BEST RESULTS apply 1-3 (for full coverage) thin coats of polish. Allow product to dry completely for full effect. No base coat and top coat required. Zoya Get Even base coat can be used if desired.Find over 300 stunning Zoya colors on www.zoya.com. Each and every color has a name as unique as the women who inspired it. OH NO. my bank account is screwed because i must have these. Tomoko & Chita are gorgeous. I'm doomed ! I'va already got 10 of the existing Pixie Dust and I guess it won't take long for me to buy these new ones ! Wow!!! they are really great summer nail colors. Hope to see more swatches of them and some reviews. Big LOVE for Tomoko!! and Sunshine.. and Dhara.. and.. ALL OF THEM! !